First of all, let me say that “workout routine” sounds a bit intense for what I’ve actually been doing during this pregnancy. I have tried to be active as much as I can, but I’ve seen other women in our birth center classes that are doing some sort of sunrise P90X or Crossfit sessions (modified I assume) and that’s not exactly ever been my level of physical fitness even before I was pregnant. But, since I get asked time to time about staying fit during my pregnancy I thought I’d share a few things that I’ve been doing to try and stay active and healthy during the last two trimesters of pregnancy. I say the “last two” trimesters because after week 7 the only thing I worked out was my abs as I puked my guts out all day—awesome! Walking: At the very beginning of the pregnancy I was mainly just doing 20-30 min of power walking in my neighborhood as often as I could. Todd would usually come with me which was nice as the early fall weather was still pretty and it was just a relaxing way to get moving and get some quality time in as well. I still will choose walking if I can’t get to my other options but it’s more of a moderate waddle lately and when I have sharp low back pain I opt for more stretching options instead so I don’t aggravate it more. Yoga: I’ve been doing yoga throughout the pregnancy but I did the free version with online videos as long as I could until the last few months. I would do this first trimester yoga video when I felt well enough and then I moved onto this leg toning prenatal session into the second trimester. Oh, it’s not yoga, but I also love this prenatal arm workout video which I need to seriously do more of…not much time left to strengthen these weak noodle arms! In January I joined Blooma, a local yoga studio, that’s geared specifically towards expecting women and mothers and it’s been pretty awesome overall. They have prenatal classes that are specifically for pregnant women and then lots of other options as well that are “preggo friendly” as well as Mommy + Me type classes and workout classes that are specifically helpful for rebuilding the pelvic floor and other postpartum issues later. They even have childcare options during certain classes so you can either bring baby with you or take an hour for yourself and have them just across the hall. To be honest, I normally hate spending money to workout, but it’s been the best self-care thing that I’ve done by far so it’s been totally worth it. They have a sister studio in Minneapolis if you live there, but otherwise you may have to poll your local Mama group to see if something like that exists near you. Barre: Yep, that’s right, they have a preggo barre class at Blooma! I put this as a different category even though it’s at the yoga studio because if you’ve ever done barre, you know it ain’t no yoga class! Yoga feels much more centering for me (and great for stretching and opening) but barre is a tough workout so it’s a nice change to switch back and forth between them. It’s actually baby-wearing friendly so it’s usually half expectant Mamas and half with their babies in carriers or on a blanket next to them on the floor. You’d think it would be chaotic but the babies seem to like it! 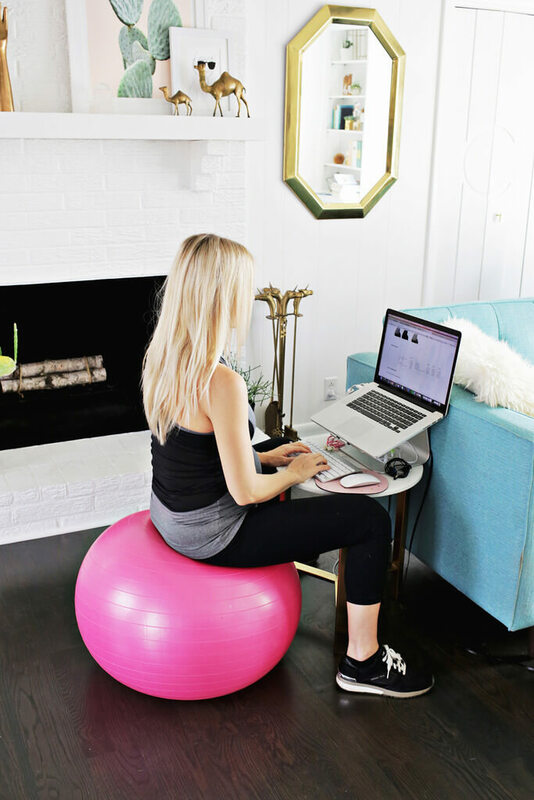 Birth Ball: I don’t do a ton of actual exercises on the birth ball, but I do sit on it a lot to help with better posture to encourage Baby to stay in a good position and to help with the low back pain. I actually turned my den side table into a temporary work station the last few months since I wanted to sit on the ball while working but needed a lower height table in order to type. It looks a bit odd but it totally works and keeps me from slinking into a couch for hours on end. Foam Rollering: This is a bit of a newer one, but since my low back pain kicked in a month ago, I’ve been adding in some new things to see what helps and a lot of people suggested I try a foam roller. It’s basically a really dense foam cylinder that you get on top of on a yoga mat or carpet and roll yourself over it to massage and release certain muscles (this is a good how-to video). I usually target my legs and glutes since my low back is an issue, but it can help with lots of different trouble spots. See my mini work station above? If I could just get a drink holder attached on the side, I’d be all set! When it comes to workout clothes, it’s gotten harder and harder to find tops that are long enough so I’m always glad I got a pair of yoga pants with the panel in the front at the start of my pregnancy so I never have to think about the belly hanging out. I’ll probably move to a more high waist option like these or these after baby to keep things tucked in a bit when I get back to working out. I also spend most of my days lately in sneakers (these are similar to my favorite pair) so I don’t overdo it when I want to wear a heel on a weekend occasion for a bit. Overall being active in these ways definitely helps me feel better, but it’s also a balance to know if you are short on time if a nap or relaxing bath may actually do more for your self-care then rushing across town stressed when you are late for yoga…Anyways, that’s what I’ve been up to the past 7 months to try and stay healthy and prepare for my birthing day! Let’s hope it all pays off come the big day!! Categories: Baby, Oh Baby | March 16, 2017 by thebandwifeblog. That sounds like an incredible studio! And the postpartum options too – that will be so handy. Especially with their pelvic floor healing awareness…I’m so glad that’s becoming a little bit more common! I have a pretty big diastasis after not doing much to heal it between three babies. It’s a big priority now but I wish I had totally closed it between each one! I’m a big Mama Natural fan, so it was fun to see her mentioned in your last post! Yeah, she’s great! So fun to browse her blog! And I know that can be such a common problem so hoping those classes will help! Ha! That’s awesome! I’ll keep it in mind!